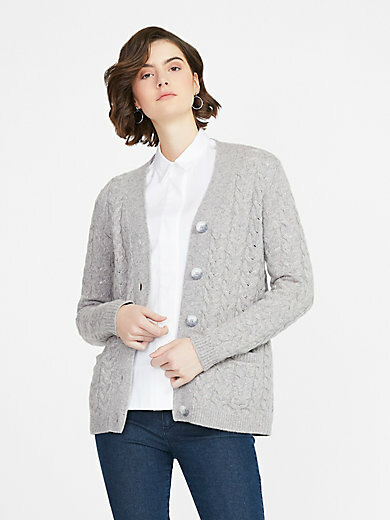 Knitted jacket by PETER HAHN V-neck with wide panel at the neckline. Large, clay-coloured buttons. 2 elaborately finished, integrated pockets with fixed lining. Slim fit. Cable knit with ribbed cuffs. The happy sheep who supply this special wool live on endless pastures in Inner Mongolia. For many years, we have cultivated a trusting business relationship with the shepherds and spinning mill responsible for turning the raw wool into this fine yarn. This guarantees us top-quality, low-pilling yarn for our cosiest pieces. 100% new milled wool. Woolmark®. Length approx. 27ins. The knitted jacket is machine washable.